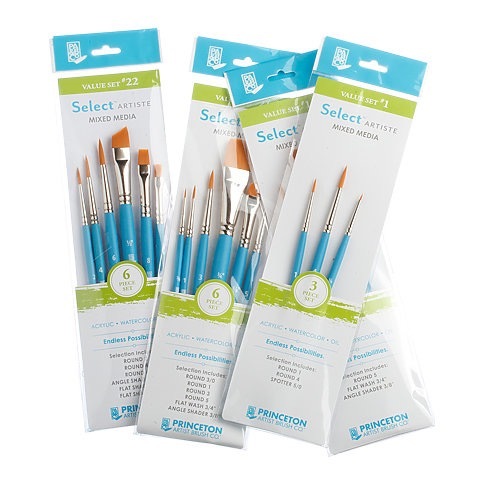 Princeton's Select Artiste mixed-media brush sets feature a variety of assortments of brushes that work well together. Specially designed by artist Willow Wolfe, these high quality, short handled brushes are made to last. With their robin's egg blue colored handles, they will be a beautiful addition to your existing brush collection as they go above and beyond basic brush shapes and sizes. Value Set #12 includes: Angle Shader 1/4", 3/8" & 1/2"
Value Set #14 includes: Round 5, Flat Wash 3/4", Angle Shader 3/8"
Value Set #21 includes: Round 3/0, 1, 3, 5, Flat Wash 3/4", Angle Shader 3/8"
Value Set #23 includes: Lunar Blender 3/8", Liner 10/0, Chisel Blender 2, 4, 6, 8, Oval Mop 1/4"